Some flavour combinations are made for each other. Think dill and cucumber, tomato and basil, cauliflower and cheese, lamb and rosemary, strawberries and cream – the list goes on and on. Get one of these lists, because if you find yourself looking for lost flavour in your cooking, the answer may be to use a classic flavour combination. By combining the right foods you can create flavour explosions far in excess of the flavour of each individual ingredient. Take an apple – it’s good – now taste a walnut – it’s also good; but eat them together and they taste amazing. Add celery and mayonnaise and you have a flavour explosion. Something the chefs at the Waldorf Hotel in New York discovered at the end of the 19th Century. I was keen to put my own spin on the Waldorf salad – I tasted all types of nuts with apple and pear, but the apple and walnut combo won every time. Then I repeated the experiment with the addition of Roquefort and chicken (another great combo). Again apples and walnuts won. 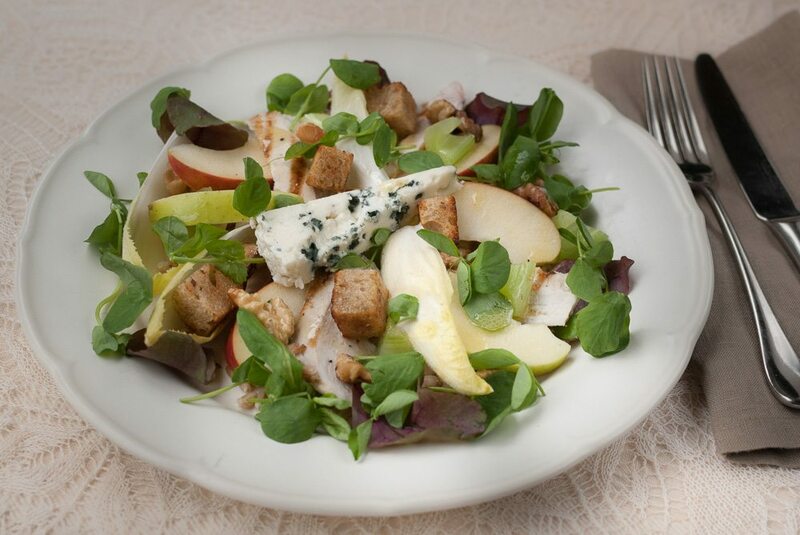 So I have my spin – and some great flavour combos – it’s a Waldorf salad without the mayonnaise but with the addition of chicken and Roquefort. Our collaboration with #MentalMovement continues… This is part of our joint venture to understand how healthy food can help support “positive mental well-being”. This is a very satisfying and tasty salad. It’s light on carbs and has lots of crunch and texture. It’s healthy too. The chicken is chargrilled and low in saturated fat, the apples are high in fibre and packed full of vitamins and minerals. Walnuts are high in omega-3 fats and a good source of antioxidants. I’ve also added some healthy grains in the form of farro. Boil the farro. Follow the instructions for the type of farro or spelt you have. It takes between 15 and 30 minutes to cook. Drain and put the lid on the pan to steam and rest. Make the croutons. Slice and cut the bread to make cubes. Heat a pan with 2 tsp of light olive oil. Add the bread and heat on a medium-high heat until browned. Toast the walnuts. Put the walnuts on a tray and put in an oven at 180C Gas 4 for about 7 minutes, or until lightly toasted. Chargrill the chicken. Slice thick chicken breasts horizontally into two thin fillets (including the flap of small fillet). Brush the fillets lightly with oil. Heat a griddle pan on a high heat and cook the chicken on both sides. Test the chicken to ensure it is cooked through. (Use the hot oven if necessary to finish the cooking.) Put the chicken on a plate to cool. Then slice the chicken fillets into pieces by cutting at an angle and set aside. Cut the apples. Slice the apples removing the core. Put in a bowl with a squeeze of lemon to prevent browning. Prepare the celery, chicory and salad. Wash the celery and peel, then chop into small irregular pieces. Peel of the leaves of the chicory and wash. Wash the remaining salad leaves and spin with the chicory. Make the dressing. Combine all the ingredients in a dressing bottle and shake (or use any other method to make an emulsion). Taste the dressing and adjust. Assemble and serve. Spread a small amount of farro or spelt onto each plate then build up layers of chicken, chicory, apple and salad leaves into an attractive presentation – end with a piece (or pieces) of Roquefort, croutons and a scattering of walnuts. Alternatively, arrange on a large platter. Serve with the dressing.